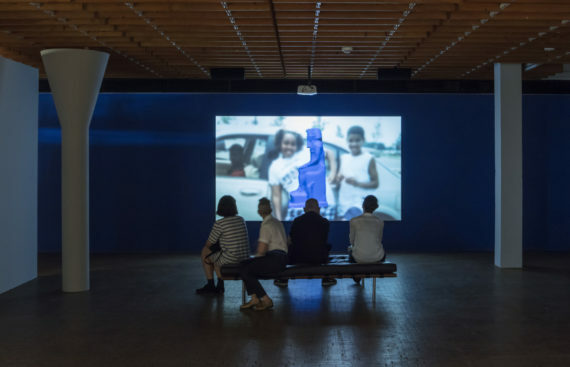 The 10th Berlin Biennale, titled ‘We Don’t Need Another Hero’, sees curator Gabi Ngcobo and her team presenting a finely balanced exhibition that allows individual works to speak and collective ideas to be explored. Cathy Wade, one of 10 a-n Artist members who attended the Biennale preview, reports from the German capital. 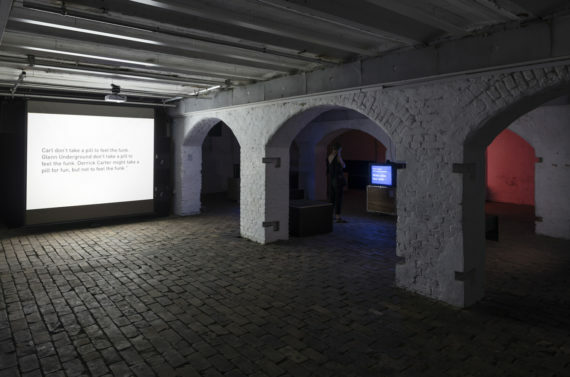 Resisting explanation and dominant models of contextualisation, the 10th Berlin Biennale, titled ‘We Don’t Need Another Hero’, initiates a place in which a cosmology of subjects and histories are entangled. Interpretation is given through the sharing of points of reference: Tina Turner/Aunty Entity singing “We don’t need another hero, We don’t need to know the way home” in Beyond the Thunderdome is recast as a refusal to be subjected to an explanation of one’s experience. This Biennale is the result of ongoing projects and collaboration between Ngcobo and the curatorial team she invited to work with her: Nomaduma Rosa Masilela, Serubiri Moses, Thiago de Paula Souza and Yvette Mutumba. 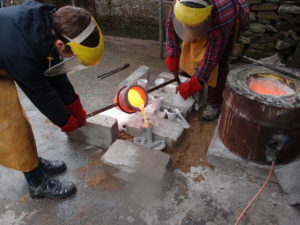 The outcomes of their collaborations are presented as an open public programme of talks, workshops and events titled ‘I’m not who you think I’m not’, a double negative that provokes and articulates both individual practices and collective experiences. The programme began in July 2017 and continues throughout the Biennale. Its fifth event was a lecture by Christopher Cozier, ‘Intransigent forms and Itinerant ways (Looking at shifty things while shifting)’ at the Akademie der Künste. The lecture focused on the temporal conditions and diverse locations in which an artwork is made and how, through exhibition, there is a desire to fix an endpoint to one author and one location, in the process excluding this multiverse of negotiation, collaboration and production. In Cozier’s view, the wall-texts placed next to an artist’s work present simplified situations that should be critically questioned as to their value for artists. Throughout the Biennale’s exhibitions, works are placed with a focus on the complex and intergenerational conversations that can be drawn between them. Sited across three main venues – with additional performances and events at the Volksbühne Pavilion – at Akademie der Künste the exhibition design creates spaces in which they can inhabit their own concerns while at the same time overlapping with others. Often, this kind of approach to exhibition making can result in an overweighting of ideas. Here, however, there is a fluidity which allows enough space for you to encounter the works individually while also considering their collective weight. Placed through the grounds and floors of the institution is Oscar Murillo’s installation, Collective Conscience, a work in which dense malformed loaves are piled as if ruptured from the vessels that contain them. You encounter mounds of stuffed cloths, some formless, some resembling torsos, some holding images of flight paths and trade routes. They are huddled together, the loaves speaking of malnutrition and putrefaction. Art is often rendered too blunt an instrument to talk of systematic violence – it becomes forced, over explains and seeks to control a narrative – but Murillo’s work holds its ground through presenting such concerns as non-specific and epidemic. 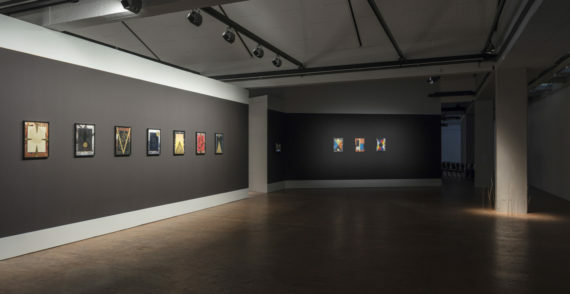 Presented in Hall 2 of the Akademie are Agnieszka Brzeżańska’s ten collaged works, Kobayashi Maru. Documentary photographs are obscured into acting as framing devices for cosmological compositions that reference an unsolvable training exercise undertaken in Star Trek that tests Starfleet’s responses to failure. Presented with these works is an overpainted TV screen with a smiley face; if you peer into its edges you see traces of a live news broadcast rendered indecipherable as a void. 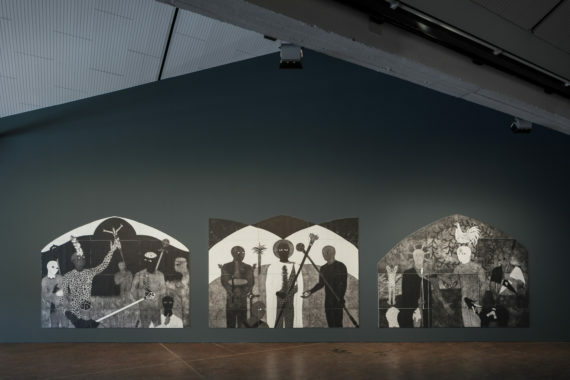 Alongside these works are monumental prints, La consagración (The Consecration) by Belkis Ayón, that depict an exclusively male Afro-Cuban Abakuá ceremony, and Minia Biabiany’s video installation Toli Toli that examines the voices of elders and the play of children on the island of Basse-Terre. Within this environment, Sondra Perry’s IT’S IN THE GAME ‘17 or Mirror Gag for Vitrine and Projection realises the core dynamics at play in the continued categorisation and objectification of everything from artefacts held in museums to the bodies of athletes replicated in video games. Two standouts within the Biennale are Dineo Sheshee Bopape’s Untitled (Of Occult instability) [Feelings] (2016–18) at KW Institute for Contemporary Art, and the installation of Tony Cokes’ work at ZK/U – Center for Art and Urbanistics. 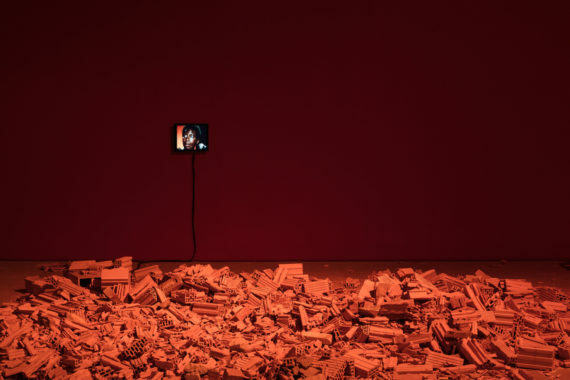 Bopape’s work has a deftness in its articulation of a psychologically-charged space – a red room that you walk into, treading through the wreckage of architectural structures, the atmosphere charged through sound and utterance. Embedded in the work is a screening of Nina Simone’s 1976 performance of ‘Feelings’ at the Montreux Jazz Festival in which the singer stops dead part way through and says to the audience: “I do not believe the conditions that produced a situation that demanded a song like that.” Placed within the installation are also three works by Jabu Arnell, Lachell Workman, and Robert Rhee that contribute to its concerns. Cokes’ work at ZK/U refuses to privilege the image and is constructed through the presentation of scrolling texts on monitors that relay the voices of those in power, undercut by song. Music is articulated as a device for torture through its use by the military, and disco becomes a weapon. Barney the Purple Dinosaur and Donald Trump are remixed, and the access to the production of culture and its suitability as a medium for protest is questioned. These practices have the criticality and strength to create their own autonomous zones within the speculations raised throughout the Biennale. The 10th Berlin Biennale continues until 9 September 2018. 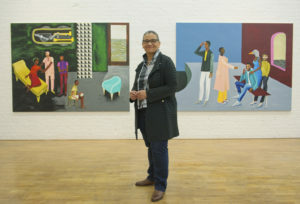 Cathy Wade is one of 10 a-n Artist members who received a £600 bursary to attend the preview 10th Berlin Biennale. The others attending were: Kurt Hickson, Nikki Kane, Helen Lavery, Susanna Osborn, Rossanne Pellegrino, Sheyda Porter, Chloë Reid, Amahra Spence, and Monica Tolia. Cathy Wade is an interdisciplinary artist who manifests work through collaboration, writing and publication. Her work is disseminated online and through material objects in formal and informal networks. 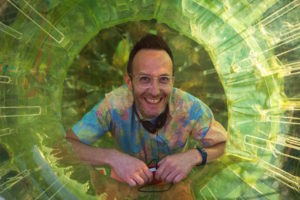 Recent projects include the publication “As We Alter It” and the Birmingham City University Wheatley Fellowship (2016). Publications include Delineator (2014) and After Carl (2014). She is currently the Course Leader for MA Arts in Education Practices at BCU.